The world's best cookers under one roof. Taste the dream at National Range Cookers. 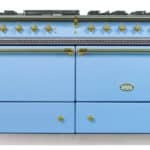 Our Cooker Brands The world's best cookers under one roof. Taste the dream at National Range Cookers. Long established in the UK, Smeg has a proven quality which shows from the very first time you touch it. Always built to the highest standard, Mercury ovens are well designed & finished, making them an outstanding British style icon. An Italian manufacturer with real pride, heritage and a real flair for design. As soon as you use a Lacanche you realise that you do not have an ordinary cooker in your hands. With its particular style which immediately makes it recognisable in any kitchen, the British made Falcon range oozes high quality. Since I854, ESSE have created their own unique style of cast iron cookers and wood burning stoves. Featuring the same quality as Lacanche Classic but with the minimalist clean lines that makes this perfect for modern cutting edge kitchen design. Boasting Britain’s top selling range cooker, Rangemaster offers a wide range of styles, sizes, and colours to suit your kitchen. 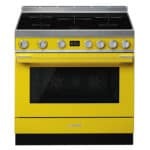 We knew that we could trust you after the way you looked after us with buying our previous cooker, that’s why we were always going to come back when we needed another. The new Esse you convinced us to buy is everything you promised and superior to the other similar brands we have previously purchased. I am delighted with the way the men delivered the cooker and hood into the kitchen, we were sure that the driveway and steps up to the front door would be a problem with such a heavy cooker, so we sent photographs to them before they arrived, and they came with planks and boards and just did it. This is the first time I have experienced a truly American standard of service since I’ve been in the UK’. This was never going to be an easy delivery and installation but the beautiful Lacanche was installed without any fuss, brilliant company. 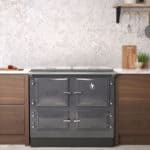 New ESSE 990 ELX range cooker incorporates three-zone induction hob, large plancha-style hotplate and re-engineered hotplate covers to deliver an increase in versatility.